Compare text to image to get people to come to a concert — a colour poster is needed to summarise all relevant information at a glance! In my vain attempt to describe the upcoming house concerts we are organising for pianists Nathanael May and Brendan Kinsella, I completely underestimated the power of a single page image that says it all. Here are the various e-mails and texts I sent out. Compare these words to a single image which speaks a thousand words. Thanks, Thera for asking yesterday, “Do you have a poster or something I can include in my invitations?” I persuaded Robert Bekkers to drop everything, stop practising, stop arranging music, and create a colourful image that contains all the information at a glance. Robert and I have returned from our coast-to-coast concert tour & sabbatical in the USA for just a few months before we travel again in August. In our adventures through 9 states in 7 months, we learned much about American philanthropy and fundraising and successful approaches to house concerts. We would like to try them here, in our home, in welcoming two American pianists who are traveling to Italy for a festival, using the opportunity to fundraise for Robert’s graduate studies with Eliot Fisk in the Fall. What is so very special about house concerts for art music (see 14-page PDF of my paper on this subject) is not just the live music in an intimate setting but also the community-building, networking, sharing of great food and conversation. We commit to organising 2 concerts from our home each year to revive that special 19th century European salon tradition. Hope you will join us for these festivities of the first weekend of July 2011, each of them completely different except for the organic wine tasting, raffle, and silent auction. Body of Your Dreams Concert by Nathanael May, founder and artistic director of the Soundscape Contemporary Music Festival in Italy, since 2005. Optional Andalucian dinner at 6 pm. Kinsella Concert from Beethoven to Rzewski by Brendan Kinsella. Optional Vietnamese dinner at 6 pm. 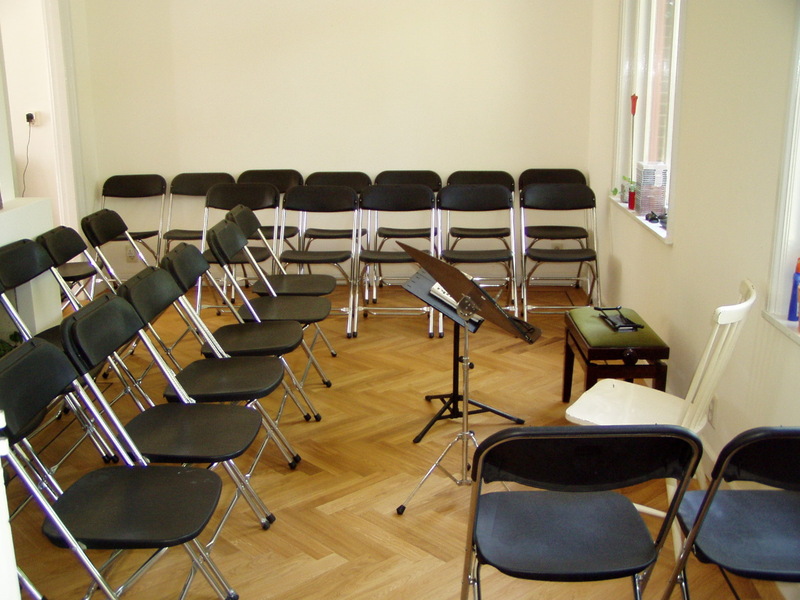 The concerts of 1st and 2nd July are 12 euros (prepaid) – including a glass of wine. Optional dinners at 6 pm are 18 euros (prepaid, reservations). We will have a raffle draw (lotterij) for prizes such as CDs, Monument House Glass Mugs, sportsclub passes, and more. Please feel free to forward this email to others who may be interested. We are also accepting donations of items or services for the Silent Auction of value over 150 euros each. Hope to see you & catch up! Question is – how do I reduce the 1 page PDF to a file size below 1.7MB — perhaps to a manageable 300 kB? Breaking news! Here is the reduced one page PDF with links (just 340 kB). Next wish: if only I have a budget to print these posters in colour and the manpower to put them up at various locations in Utrecht! We will never say no to sponsorship! The fastest and easiest but not necessarily the most effective way, is to announce that there is a concert. Give the essential information such as who is playing, where it will be, when it will be, what will be played, whom to contact for reservations and information, and how much it would cost if it’s not free. An effective message to get people to come to a concert is one that welcomes them and gets them to reserve a ticket and put it in their diary. Remember the AIDA principle: Awareness, Interest, Desire, Action. There are many ways to get people to come to a concert. The fastest and easiest, but not necessarily the most effective way, is to announce that there is a concert. Give the essential information such as who is playing, where it will be, when it will be, what will be played, whom to contact for reservations and information, and how much it would cost if it’s not free. I say it’s fast and easy but not effective because an announcement doesn’t call you to action. It simply states a fact. Something is going to happen. The reader may digest it like a piece of news. No action needs to be taken. Book early, only 50 seats. Reserve by prepayment. How can we improve upon this concert announcement? Give a bit more information? Spice it up with words that make the reader curious or motivated to reserve a ticket? Or perhaps describe the venues, just how convenient it is to get there and how special the locations are. Only 5 minute walk west of central Utrecht station, along a canal with houseboats, after a windmill, before the famous building of the Dutch Royal Mint (Munt in Dutch) that houses the Money Museum. The two houses are “herenhuis” with high ceilings and wide entrances. Maybe it’s worth mentioning how unique this event is. A grassroots event, local musicians collaborating with local artist and neighbours to welcome guests into private homes to experience that tradition of chamber music in an intimate and relaxed setting followed by conversation over homemade finger food and selected wines. While words may tempt, they don’t necessarily invite. An effective message to get people to come to a concert is one that welcomes them and gets them to reserve a ticket and put it in their diary. Remember the AIDA principle: Awareness, Interest, Desire, Action. In our fourth year of producing the Monument House Concert Series, we like to invite you to the home of local artist Elsbeth Carp where we will be giving a one hour concert on Saturday 17th April 2010. Elsbeth has fulfilled every child’s wildest dream: to draw and paint on the walls of her home. It’s a spacious place with huge walls and high ceilings that she has decorated and designed with great artistry. Each time we visit, we are inspired by her imagination and talent. After senseo coffee provided by Douw Egberts, we shall begin the performance. We will take you back in time, to the 19th century salon concert tradition when guitarist Giuliani and pianist Hummel got together to play the “Grand Potpourri National” and other virtuosic and fun pieces. We have invited musicologist/composer Rolf Straver from Nijmegen to tell you about the pieces in the potpourri. After the concert, we will walk a few doors down to the double-herenhuis home of Elsbeth’s neighbours Ivo and Paulien whose passions are cooking and traveling. They are planning a menu from the Mediterranean kitchen and selecting wines to go with the gourmet delights they will make. We are sure this will entice you to stay and converse, like the good old days — before mass media and the Internet. Because of limited seating, we ask that you book as soon as possible by pre-payment into the bank account specified on the website. Please mention in the description in the online banking field how you found out about the concert, e.g. 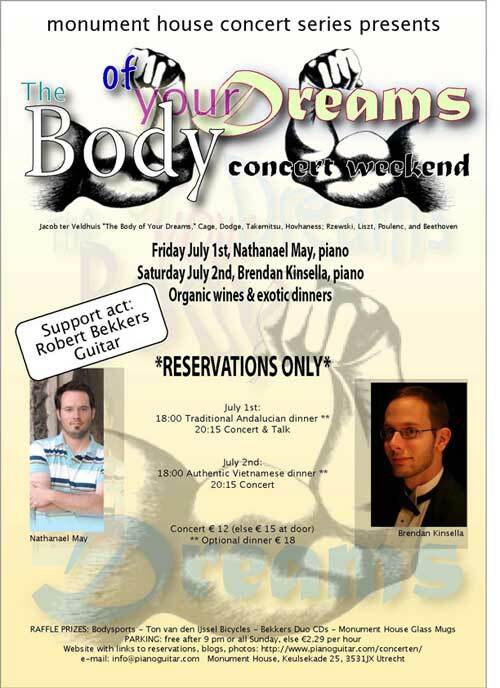 invitation from Bekkers Piano Guitar Duo, etc so that you will get an e-mail confirmation. Now tell me, is this an invitation you can refuse?